← If you ask me, brushing your teeth is a gift. My kids prefer money. Well, it’s been a nice summer. This morning, I got my two older boys suited up and sun blocked and dropped them off at our local baseball camp. Camp ends at 1pm, and I try to come early to watch a bit of their play, so I’m on the tick tock if I want to get anything accomplished. My youngest, actually hasn’t started camp yet, and is trucking along right beside me. Let’s go kid, chop chop. You wanted camp mommy, you got it. I’m trying to fit in the gym, run to Payless for swim shoes for my boys and get to the store for sunblock, milk, eggs, toilet paper and cat liter. There are also clothes at the dry cleaners that she might start charging me rent for if I don’t pick them up soon, and a birthday gift that I’m a week overdue on sending. While I’m rushing around, trying to get it all done, I run into a friend, busy doing the same. Well, sort of the same, she was running from the gym to a manicure appointment. I definitely need to work on my list. “Can you believe it’s summer?” She asks. I think about it for a moment. School is definitely out. The graduation ceremonies, picnics, parties and general hoopla is over. Half my town has left for sleep-away camps, but I’m still up early, packing backpacks, making snacks, entertaining, cleaning, schlepping. To me, the idea of summer vacation, instilled 100 years back, is carefree fun and frolic. This is like any other season, but with more sweat. “Nope. I can’t believe it.” I say. “We should get together!” She exclaims. We look at each other, with a knowing smile. We both head off in our own directions and I mentally add ‘school supplies’ to my over-crammed list. 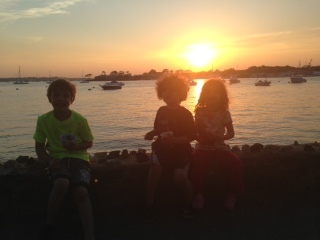 Posted in Every Day Scoops, Uncategorized and tagged summer goes so fast, summer's over, summertime fun, where does the time go. Bookmark the permalink. I totally relate to this. It’s driving me crazy– I can’t schedule anything. Hrrumph. what happened to summers of fun? i haven’t gotten a chance to show off my fabulous summer frocks while drinking chardonnay at sunset. Ha! I had this exact conversation with a girlfriend yesterday. We couldn’t find a date until the end of August. Scary! I’m with you sister, we need better to do lists filled with more pampering and fun (as if all that will fit in the two hour window I have while the girls are at camp)! Enjoy! it goes so fast! it’s so weird. remember when summers lasted forever..? Uh huh, I can relate to this! We got through the same thing….Summer whips by and I think I have time to do the BTS shopping, but end of August always catches me at Walmart with the kids, picking at left-overs from what On The Ball shoppers turned their noses up at from the end of July. Once Staples starts playing the “It’s the most wonderful time of the year” ad, I know my summer’s about to flatline. So true!! i know that staples commercial!! and i always mean to get it all done early but am always scrambling too! It’s insane. I still work full-time, so the girls are scheduled back-to-back all summer. Same morning routine, earlier pick-ups that toss me into evening work hours, and more laundry (oh, the camp towels. so many camp towels). summer is so fun, right? sunblock, humidity, sopping towels… what has happened here?? Weird. It just put my twitter handle. That was me! Hi! same!! over here we’re mark baseball game to baseball game.. as in 6 more games ,we go away. 10 more games summer’s over. The fact that it is already *July* is ridiculous. Ridiculous, I say. i’m with you. hot and ridiculous over here! My kid is much older now…Im here to tell y’all that it ends at some point. But then you’re frustrated with your friends who have younger kids and can’t schedule anything…Oh how soon we forget! This was a great reminder for me. Thanks. Ha! You just described us too – especially this summer with travel baseball! I think things will calm down in the fall, for me. Hope that’s the case for you too! we’re getting ready for a game as I type. and it’s soooo hot!! Summer always goes by in a blur, but I love every minute of it. i try to… except for the sunblock and the bugs! It’s so insane, but there are back to school supplies in my Target already, and I can’t help but think that it’s just the beginning of July, and there is still so much summer to go, so why are we thinking about September already. I want more weeks of 9pm sunsets, outdoor barbecues, and summer nights. I love fall too, but I’m not quite ready yet. the list goes on and on…. it’s good to stick in those fun things every once in awhile! it is busier – at least so far! this is not at all what i planned!! where’s my Margarita?? !